The number of fatal bird collisions at wind turbines is rarely studied in relation to the number of birds observed crossing an area. The reason might be that the acquisition of such data is time consuming, costly, and not trivial. The analysis and interpretation of radar data is especially difficult. Furthermore, there are a variety of radar systems and not all systems are technically suitable to answer all research questions. A big challenge in radar ornithology is differentiating birds from all the non-bird objects (precipitation, clutter, insects, bats, aviation etc.) which are usually detected by radar. Until now, only a few radar systems allowed automatic identification of birds and other targets. Most radar systems which can record tracks of birds (e.g. marine T-bar antenna radar) are not able to accurately quantify the number of birds. For a proper quantification of bird numbers, the volume of the surveyed airspace and the detection probability for birds have to be known. The volume depends on the shape of the radar beam transmitted by the antenna which is not known for all types of antennas. Furthermore, detection probability of objects decreases with increasing distance from the radar. Thus, the maximum range of detection depends on the size of an object, and for each size class of bird a different detection range has to be considered in order to correct the data for the detection probability. Study area with one of the three wind turbines (25.08.2015, Archive of the Swiss Ornithological Institute). We used dedicated bird radar that was calibrated to quantify the number of birds crossing an area in the vicinity of Le Peuchapatte wind farm that has three wind turbines (Enercon E-82, 2,3 MW, 150 m total height including rotor) and is located in a mountainous region of Switzerland (Swiss Jura mountains, 1100 m above sea level). 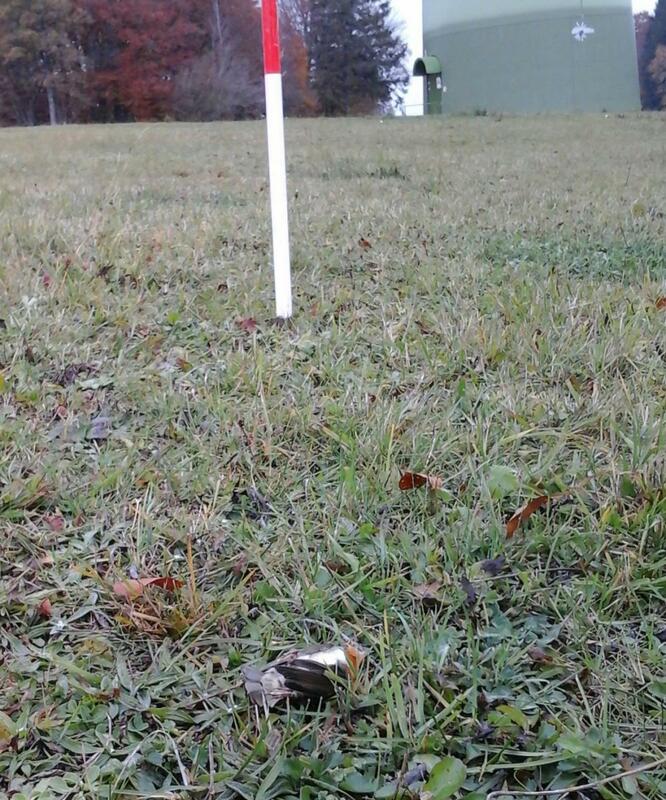 Simultaneously, the ground below the wind turbines was systematically searched for carcasses. Our radar data were analysed in relation to a virtual vertical window area perpendicular to the main movement direction of birds. We estimated that in total at least 1,650,000 birds were crossing the virtual window area of 1 km length up to a height of 2,550 m above ground level between March 1 – November 15, 2015. 390,500 of those birds flew within the height range of the virtual window (1 km x 200 m) where the birds were confronted with the collision surface of the wind turbines. 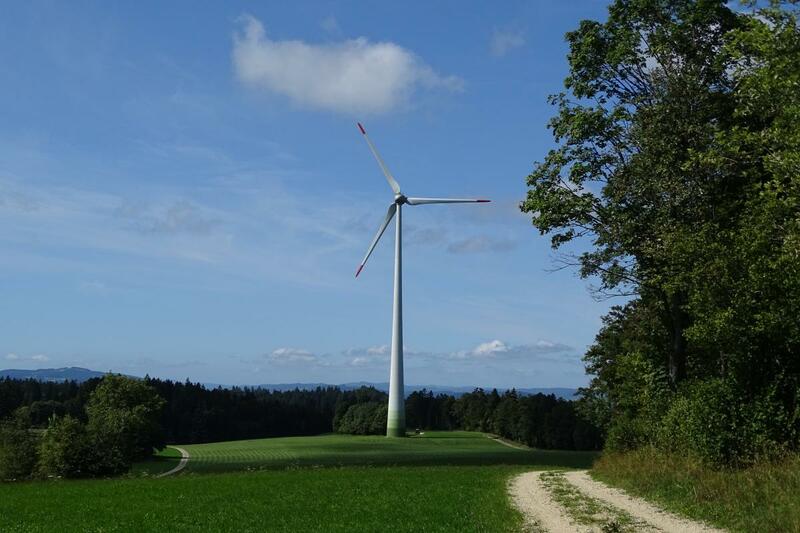 The collision surface of one wind turbine covers 0.25% of the 1 km x 200 m virtual window area (projection of the rotor blades and the part of the tower overtopping the trees). Under the assumption that birds are randomly distributed in the airspace and do not avoid the wind turbines, 0.25% of the 390,500 birds per wind turbine were theoretically at risk of a collision, resulting in 976 birds per wind turbine. 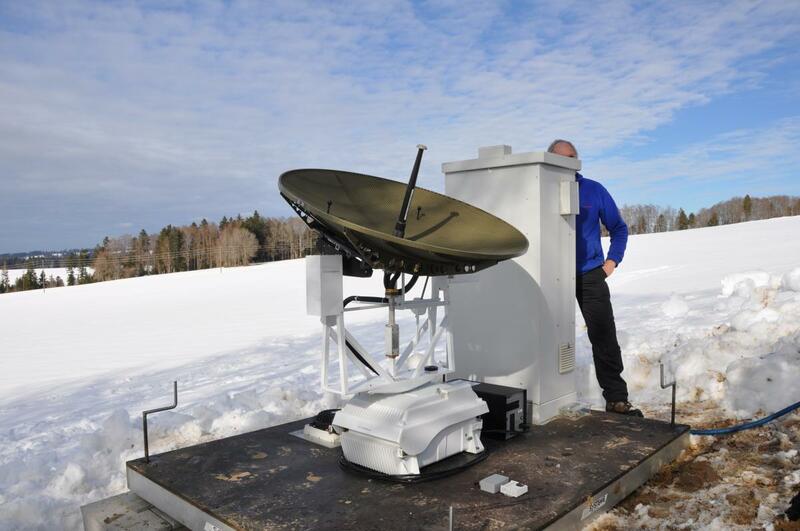 Set-up of the radar device BirdScanMT1 (26.02.2015, Archive of the Swiss Ornithological Institute). Visible are radar unit, elevation system, dish antenna and electrical cabinet comprising the radar control. Per standard practice, the number of carcasses found in the field has to be corrected as it is impossible to find 100% of the carcasses. Carcasses can be missed during the searches (searcher efficiency), carcasses can be removed by scavengers (persistence time) and a certain proportion of carcasses lie outside the searched area (e.g. in forested areas). The result of the carcass search study including the aforementioned correction factors (search efficiency, persistency time, and area of appropriate search habitat) was an extrapolated number of 20.7 bird collisions per wind turbine for a study period of 8.5 months. Thus, 2.1% of the 976 birds theoretically at risk actually collided with the turbines. Most of the collisions occurred during migration periods and involved mainly kinglets and other nocturnal migrants. Carcasses were found below all three wind turbines, but were not evenly distributed (10, 4 and 7 carcasses per turbine). Assigning collisions to specific nights and weather conditions was rarely possible because it was unknown how long a carcass had been lying in the field for a short search interval of two to three days. Even daily searches might not find all carcasses from the previous day’s collision event. Nonetheless, there is considerable evidence that migration intensity in connection with local weather conditions (visibility) are relevant factors increasing the collision risk. A post hoc analysis showed that the visibility had been limiting at least once during the three days prior to finding carcasses in 2/3 of the cases. While measurements of songbird migration (mainly nocturnal) intensities could be collected on a regional scale, weather condition information on visibility needs to be site specific. Knowing these parameters in real-time would allow for collision rates to be reduced by a shut-down regime without an important loss in energy production. However, mitigation of collisions for local breeding birds and migrating soaring birds like raptors and storks would not be possible with the kind of radar measurement methods used in this study. This is because this method measures a constant flux of birds and would initiate shut-down when a certain threshold of bird movement intensity was reached. Such a flux is not common for breeding birds and migrating soaring birds. Carcass of a European Robin (Erithacus rubecula) found below one of the wind turbines (21.10.2015, Archive of the Swiss Ornithological Institute). Overall, the study shows a methodology to relate the number of birds crossing an area to the number of fatal bird collisions at wind turbines over almost one year, determining a relative collision rate for the first time. Furthermore, the study shows that more weight should be given to the collisions of small birds in the current discussions about the impact of wind energy on birds in Europe. The methodology to determine correction factors (searcher efficiency, persistence time, habitats) within carcass searches should also be targeted for small birds. Finally, future studies that relate bird movement intensities to bird collisions at wind turbines should consider visibility systematically. Based on this work, studies may need to be repeated in other locations.